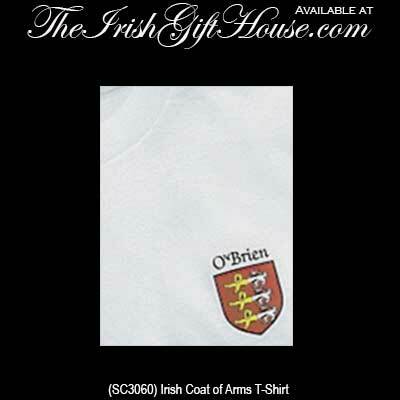 Irish coat of arms t-shirt features the Irish family name along with the color coat of arms on the left chest. When you select a name that requires an apostrophe, such as O’Shea, from the drop down menu, you will notice that the apostrophe has been omitted. Do not worry; the selected name will be spelled correctly on the Irish coat of arms t-shirt with the apostrophe included. 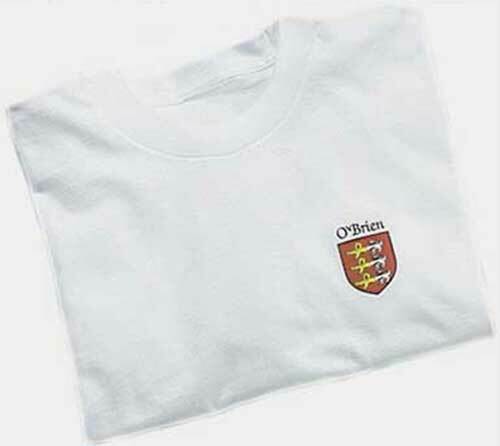 The left chest of this pre-shrunk 100% cotton white t-shirt is imprinted with your Irish coat of arms along with your family name. Choose from both youth and adult sizes and select from over 900 Irish coat of arms. The heavy weight Irish coat of arms t-shirt is a special order item, from The Irish Gift House that ships directly to you or to the gift recipient from our supplier; please allow 2 weeks for delivery. Washing Instructions for the Irish coat of arms clothing are as follows. For best results, turn the t-shirt inside out and wash in cold water using a mild detergent. Do not use bleach. Dry on low heat setting. Do not iron directly on the imprinted area. This long sleeve Irish shirt features your Irish coat of arms prominently displayed on the chest. Irish coat of arms t-shirt features the Irish family name along with the color coat of arms as a full chest design. Irish coat of arms t-shirt features your name personalized as the owner of an Irish pub and it is augmented with the Irish flag colors.